I watched Shrek 4 on TV recently. Honestly I did not know that there was a fourth part to the series and like a rubber band stretched to the limit the plot was very thin and the enjoyment was considerably lesser. The usual suspects and the progression of the hero into parenthood and the first birthday seemed promising but then the plot got tangled into a big loop and like I ended the Valentine’sDay story series the makers ended the confusion as one bad dream. i) You do not realize what you have till you lose it: A basic truth which is usually overlooked. We take so many things for granted that we start abusing what we have from our lives, bodies, homes and environment; usually deprivation teaches us hard lessons. But we are poor learners. ii) The exit clause: We seem to seek for an exit clause for many things, we just want to break free or get away and we end up doing things that are not right. In a race it is imperative that the course must be completed any other outcome is an exit clause but having started the race is it worth looking for an exit clause? Why not avoid the race completely? 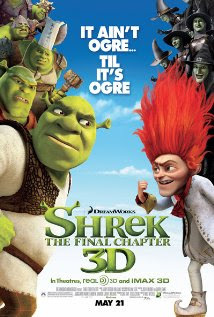 iii) All it needs is love: In the case of the Shrek series, love’s first kiss is the main event of the movie and so it is with Shrek 4 and after the kiss they lived happily ever after. In hindsight the problems of the world can be solved to a great extent by love, give a little love and make someone smile. Predictable they may be but even the kids movies can teach you a lot. Yes, love is all we need and oodles of common-sense, if I may add. Postscript: How did Trinity enjoy this one?